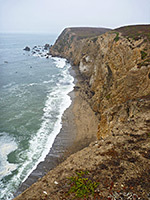 The majority of the westernmost portion of Point Reyes National Seashore is relatively flat and low-lying, a mix of pasture, marshy areas and lagoons, but the land rises abruptly to the south, as the land narrows, reaching a highpoint of 615 feet, part of a 3.5 mile wide ridge that forms the far edge of the peninsula. 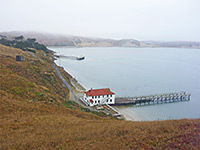 This is Point Reyes, a mostly cliff-bound location that projects outwards at each side to create two promontories; Point Reyes Lighthouse overlooks the western tip while the equally historic Point Reyes Lifeboat Station is close to the east end. 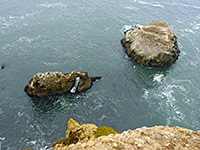 Both locations are reached by short trails, and the latter route continues 0.8 miles to the far edge of the point, overlooking Chimney Rock, a small sea stack. 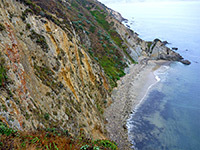 This route, the Chimney Rock Trail, runs close to the ridgeline of the promontory, offering views of inaccessible beaches at the foot of very steep, crumbling cliffs, and beyond across the ocean and the wide sweep of Drakes Bay, bordered on the far side by the high, wooded terrain at the center of the national seashore. Owing to its relative height, and being mostly surrounded by the ocean, the point is often the last section of the park to become clear of the prevailing sea mist, and frequently remains completely foggy all day, so as a result the trail is not much used. The lighthouse is said to be the foggiest place in California. Beside the fine views - even on poor visibility days, the stark, lonely, windswept scenery is quite striking - the point is also notable for the great variety of wildflowers that grow here, including some species not found anywhere else in the park. Point Reyes National Seashore map. The drive from Bear Valley visitor center, along Sir Francis Drake Boulevard to the trailhead is 20 miles, and takes at least 40 minutes; up the west edge of Tomales Bay, over the tree-covered Inverness Ridge, and across the grassy, pastoral land at the center of the peninsula. The road passes through several working cattle ranches established in the 1850s and 1860s, all denoted by letters - the most distant is A, by which time the road surface has deteriorated. The last few miles are particularly bumpy, with tight turns and short but steep climbs, as the road rises to the top of the ridge marking the edge of the peninsula. The main route continues a short distance to the lighthouse, while a side road (with a 15 mph speed limit) forks eastwards to the parking area for the lifeboat station and the Chimney Rock Trail. Information notices at the trailhead include pictures of some of the 90 plus wildflower species recorded in the vicinity; the best place to see them seems to be right at the very end of the trail, as the land starts to slope down. The path is 0.8 miles long, level overall though the first half climbs slightly by about 50 feet up to a low summit, while the latter section descends towards the final viewpoint. The surroundings are for the most part covered only by flowers and short grass, with just a few shrubs scattered about, and some bush lupines that reach a height of 3 feet. The trail passes close to the lighthouse buildings - not generally open to the public but sometimes viewable on tours in the spring - and along the edge of a clump of cypress trees, then out to open hillsides, heading towards the crest of the ridge. 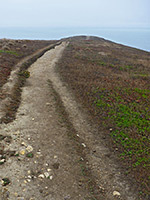 A number of unofficial but well-used spur paths branch off to viewpoints at the edge of the bluffs, all marked with disapproving notices since the cliffs that line all parts of the peninsula are very steep and unstable, made of loose earth and stones rather than solid rock, so walking away from the actual trail is not advised. Cracks and fault lines are visible at some of the edges. The last part of the path runs slightly downhill, to a fenced overlook, set back a few feet from the original end point which is now off-limits due to erosion. 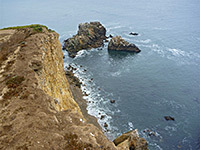 The surrounding bluffs are partly covered by extensive colonies of the sea fig (carpobrotus chilensis), one of over a dozen non-native plant species that grow on the peninsula. 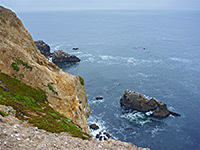 The views along the latter reaches of the path are of 200 foot cliffs above pretty but completely unreachable beaches, often with noisy elephant seals in residence, plus plenty of offshore rocks, all buffeted by fierce waves. Migrating whales may be spotted between January and May. Unless completely fog-bound, the vista extends across Drakes Bay to the long line of cliffs on the far side, stretching south towards Bolinas.